To find two libraries content to seduce with such compelling, delicate charms is a delight. Will appeal to composers and producers. Some parts of Composer's Toolkit could have more sounds. Two of Spitfire Audio's recent releases are designed to pick up on the excitement caused by the release of Enigma, Leo Abrahams' library of warped and wonderful guitar textures, which has found favour with producers and composers alike. Olafur Arnalds' Composer Toolkit and Samuel Sim's Chrysalis, like Enigma, offer the distinctive sound of two leading composers. The libraries are available separately and both require the full version of NI's Kontakt 5 sampler to work. Download for each library is made available after purchase from Spitfire Audio's own download application and, once this is complete, all you need to do is point Kontakt at your chosen drive location and you're good to go. Chrysalis is the slightly larger library of the two, occupying 15.86GB of hard drive space, while the Composer's Toolkit requires 15.22GB when unpacked. Olafur Arnalds' Composer Toolkit presents the felt piano as its primary sound source, though, as we'll find out, there's plenty more here besides. The main piano is available via two primary patches - a 'Mixed' treatment which blends the piano source with an evocative and delicate pad, and as a separate program, which offers individual microphone sources you can use independently, or blend together. These instruments are worth the entrance fee alone; composers, please note that you'll lose hours on these two instruments, such is their seductive playability. However, it's well worth exploring the full Composer Toolkit folder too, with sounds here organised into further sonic categories. The Organic Warps folder contains pads, atmospheres and textures designed to sit under other instruments, providing layers of delicate sonic richness, which are perfect for adding additional bedding to your productions. The Synth Embellishments folder goes further, offering a plethora of richer pads and instruments, many of which benefit from analogue synth circuitry passed through pedals and effects to wonky, dusty end points, giving this collection an incredible sense of character. The Tempo Locked folder is also highly useful (if a little sparse), giving you sequences and rhythms which locate your project's tempo and offer highly playable patches which are equally happy driving things forward or slotting into busier arrangements. At the core of Spitfire Audio's other new library, Chrysalis, is the harp of composer Samuel Sim. Like Olafur Arnalds' Composer Toolkit, this multi-sampled core sound is available in one folder of the Chrysalis library, called Initial Pupae, which features a number of harp articulations captured through a broad collection of mixable microphone sources. Things begin to take on a more experimental edge through the following folders, which use these harp recordings and mutate them via a number of processors and techniques. The Nympha Pedals folder provides patches created by recording the harp through a chain of guitar effects pedals en route to a Marshall JCM800 amplifier. These new recordings have then been sampled back into pads, textures and highly evocative, playable programs. The Metamorphosis Warps folder uses 23 sound sources blended via individual sliders, where the original harp recording is joined by a processed 'version' of itself, allowing you to create original sounds from 'straighter' to more 'warped'. Finally there's the smooth as silk Cocoonase folder, awash with textures, ambiences and pads, which also features the twin-slider approach to allow you to create your own sonic balances. 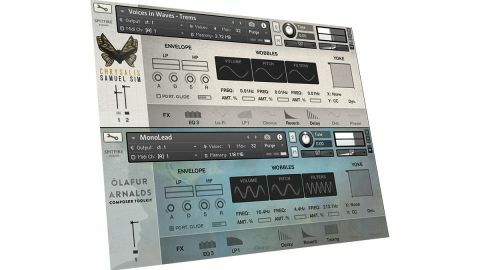 While the GUI is different to the Composer's Toolkit, both libraries also offer internal effects aplenty, with EQ, Lo-Fi, Filtering, Chorus, Reverb, Delay, Distortion and Phasing all ready to be configured per program. So, are both libraries for composers only, or is there plenty of interest for EDM and Pop producers too? Without question, the latter. What's so pleasing about both collections is that, while they will certainly appeal to composers seeking immediate, evocative tones to accompany picture, they're excellent 'mixers'. In other words, if you're looking to add extra flavour to existing sounds in your tracks, perhaps because you're seeking additional weight and atmosphere, copying your existing pads and ambiences to these patches will add the depth you seek. Simultaneously, you'll widen the stereo image of your mixes and increase the sophistication of your productions. Any quibbles? Based on the material provided, none; though the greedier side of us feels that some folders within the Composer's Toolkit, in particular, could be more generously stocked with sounds. This is particularly true of the Tempo Locked folder, which has just five patches, beautiful though they all are. However, this is a minor criticism as both libraries are a joy to play and each patch inspires musical ideas in its own right. If you loved Enigma, you'll love both of these too, irrespective of your chosen musical style.